RENO, NV MARCH 2, 2011 Torchmate Racing debuted its new Ultra4 car at the 2011 Griffin King of the Hammers with JT Taylor and Nick Socha navigating, alongside teammates Jesse Haines, Roger Lovell, Brad Lovell and Rusty Bray. Roger Lovell finished 17th, Rusty Bray finished 45th and Jesse Haines finished 46th. JT Taylor’s rear drive shaft along with cooling issues and Brad Lovell’s front differential were the final challenges in their race efforts on Friday February 11, 2011. “The Torchmate crew attacked and conquered all the challenges of the week, it is an amazing group of people that are strong willed and ready to help each other get to the start line and all the way to the finish line,” said JT Taylor, Torchmate Racing General Manager. When the green flag dropped on race day, JT Taylor and Nick Socha were incredibly quick to settle into a rhythm in the new Torchmate buggy, passing over 40 competitors in just 20 miles. When the team got to the parking lot in Outer Limits the over temp light came on and they had to work through the obstacle 100 yards at a time, stopping, then going again. With multiple attempts at trying to relieve the problem, the cooling issue and a bent rear driveshaft were the ultimate demise for the new Torchmate car leaving #13 JT Taylor calling out of the King of the Hammers for the third year in row. “The car is amazingly fast and agile. I am optimistic that this new Torchmate car can compete at the highest levels and am excited to campaign it in the entire Ultra4 series this season,” JT Taylor stated following the race. Torchmate master fabricator Jesse Haines and co-driver Rich Klein had their own issues. The race got off to a rough start, as Haines experienced an engine fire shortly after leaving the starting line. Klein ran back to the main pit for parts, they repaired the damaged vehicle, and departed nearly four hours later. Knowing that they were not racing for the win, Haines and Klein ran a relaxed pace and made few mistakes. With less than 15 miles to the finish line, a suspension link failure left the team disabled. Fortunately all the good karma Torchmate had amassed over the week paid off, and a fellow racer let Haines borrow his spare suspension link. The team was the 46th finisher in the race, second to last across the finish line with only 90 seconds to spare! Brad’s brother Roger is perhaps best known for spotting Brad to numerous rockcrawling championships, but the Torchmate racer is a highly decorated driver in his own right. Starting in the 9th position, Roger and co-driver Dallas Ashley ran a conservative pace on the first lap, preserving the #4432 race vehicle. Virtually nobody can run 120 miles of brutal terrain in Johnson Valley without issue, and on the second lap Roger experienced a rollover that set the team back. They were not deterred, but fuel deliver issues from that point on prevented the pair from running at their previous pace. Roger represented Torchmate Racing well, finishing 17th out of 100 competitors at the 2011 Griffin King of the Hammers and automatically qualifying for next year’s race. The newest edition to the Torchmate Racing team is East Coast veteran Rusty Bray. Bray competed in the 4Wheel Parts Last Chance Qualifier in his Jesse Haines-built buggy and finished 6th out of 70 competitors to secure a spot in the main race, starting in the 24th position. Unfortunately, they had to give up ground to those who started behind them when overheating issues occurred at RM 24. Bray and co-driver Mike Hullfish used their ingenuity to overcome the cooling problems, and continued on to finish 45th in a race where less than half the field reached the finish line. “It was good to get the new car out, it was a good introduction to people with our company and 4 Wheel Parts with them selling the Torchmate products, and all our team made it back safe. That’s what we were looking for,” wrapped up Torchmate CEO Bill Kunz. The next stop for the Torchmate Racing Team will be the Mint 400 in the Torchmate Class 7 truck and then on to the Best in the Desert’s Silver State 300 as part of the Ultra4 Series. 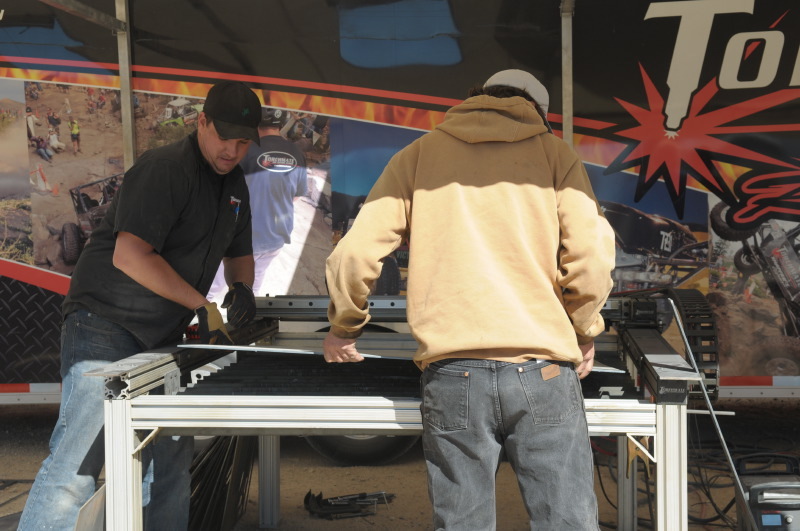 Torchmate Racing will campaign five vehicles in this desert race on their quest to win the Ultra4 season championship. Torchmate CNC Cutting Machines can be purchased and more information can be found at www.Torchmate.com and www.4WheelParts.com.